1. Preheat oven to 350°F. Spray an 8×4-inch loaf pan with cooking spray at set aside. 2. 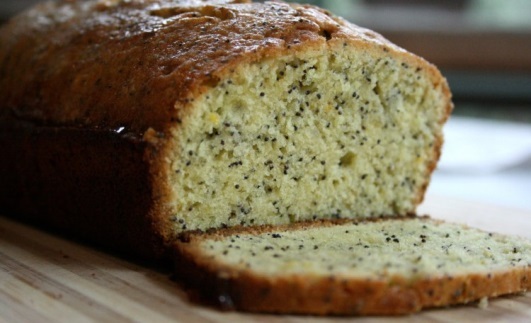 In a large bowl, mix together flour, sugar, oat bran, poppy seeds, baking powder and salt. 3. In a medium bowl, whisk together milk, butter, egg, lemon juice and lemon zest. Add wet ingredients to dry ingredients and mix just until dry ingredients are moistened. Spread batter in prepared pan. Bake for 40 to 45 minutes, or until loaf is light golden brown and a wooden pick inserted in center of loaf comes out clean. 4. Cool loaf in pan on a wire rack for 10 minutes. Remove loaf from pan and cool completely on rack. Cover with plastic wrap and store at room temperature or in the fridge. Hey Guys! Have you ever wondered what is good for your brain? Today we discovered that Friendship indeed is a great thing for your brain! Who would have known! To read more on this topic, click here. We discovered this blog from MindBodyGreen. If you would like to check out other blogs posted on that website, click here. 1. Preheat oven to 350°F. Line a 9×3-inch baking pan with parchment paper, letting the paper overhang on two opposite sides (so you can use it as a sling to pick up the granola bars after baking). 2. Combine first 9 ingredients in a large bowl. Mix well. In a medium bowl, whisk together pumpkin, honey, butter and vanilla. Pour wet ingredients over dry ingredients. Mix using a wooden spoon until dry ingredients are coated with pumpkin mixture. Make sure there aren’t any dry oats in the bottom of the bowl! Stir, stir, stir! 3. Pour the wet granola mixture into the prepared pan and spread it evenly to the edges. Using your hand, press down firmly on the granola so that it’s tightly packed in the pan. 4. Bake on middle oven rack for about 25 minutes, until top turns a light golden brown and feels dry to touch. Remove pan from oven and cool completely on a wire rack. Lift cooled slab of granola from pan by holding on to parchment paper and transfer to a cutting board. 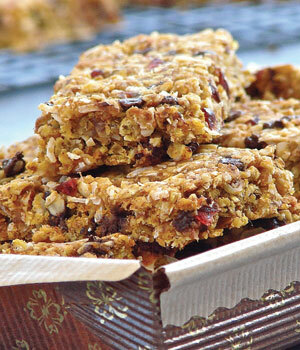 Using a large, sharp knife, cut the granola into 16 bars, about 1 ½ x 4 inches each. (Tip: Press down with the knife to cut the bars and avoid a sawing motion.) Wrap bars tightly in plastic wrap and store in an airtight container, either at room temperature or in the fridge. Friday Education: Bad Mood Got You Down? Welcome to our first Vlog of 4 for the Sit Fit Series with Sherry Morton Jibb. Enjoy! Hey Guys! Today we will be posting a blog on sleeping! Ever get a sore back during the night? Follow these tips and you will have a painless wonderful sleep! We found this blog from http://www.mindbodygreen.com/ if you want to check out any other articles/blogs! As some of you may or may not know I have recently completed my Pilates Teacher Training and have been Team teaching with the girls for about 2 months now. So comes the time for me to teach my own classes J This week I got the opportunity to write a blog letting you guys know a little about the classes I have chosen to put on the schedule. The schedule is already full of great classes that cater to every level of Pilates and Yoga enthusiasts and newbies….so how could I offer something that would cater to maybe an untapped market? Well the girls and I had a little brain storm and came up with…TIME! Some of you may be early birds… ….some may work all day and only are able to come in the evening…some may be weekend warriors! So this is what I came up with….I’m going to offer 3 new classes at new times starting the week of March 31st! Please make sure you contact us before dropping into a class as classes being offered are dependent on participation. If we don’t have enough people signed up we can’t run the class. Pilates Foundations- This Class is a great follow up to Pilates for Beginners. Taking the principles and basics from the beginner Pilates Series and adding progressions, Pilates Foundations will take your practice to the next level prepping you for progress into intermediate and advanced classes. Pilates Cardio & Strength Circuit- Get the best of both worlds with this Level 2 Pilates Class. Mixing Cardio with Strength Training, Pilates Cardio & Strength Training Circuit is a fun, fast paced class that will keep you coming back for more! Summer Ready Pilates- Get ready to feel the burn! In all the right places :D…This class targets those sometimes pesky problem areas and gives them strength and tone. Taking exercises from the intermediate and advanced Pilates repertoire and mixing them with cardio exercises, Summer Ready Pilates is sure to give you the challenge you are looking for. Hopefully these classes will allow more of our community to try out Pilates and get to feel and see the benefits the practice offers. If you are interested in these or any other classes on the schedule please contact the Studio at 647-1445 or email us at balancedmotionstudio@gmail.com. Check out the full schedule on our website here. 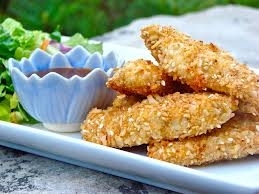 Strip T’s –Sesame and coconut crusted turkey strips with pineapple plum sauce. In a large bowl, whisk together egg, hoisin sauce and sesame oil. Add turkey strips and (using your hands) toss to coat marinade. Cover and refrigerate for 30 minutes (or longer if possible). Prepare sauce by combining all sauce ingredients in a small pot. Cook over medium heat until sauce is bubbly and has thickened. Keep warm. Preheat oven to 450 degrees F. Working one piece at a time, shake excess marinade from turkey strips and roll in crumb mixture. Make sure strips are well coated with crumbs. Place on a cookie sheet that has been sprayed with cooking spray. Repeat with remaining strips and coconut mixture. Spray tops of strips with a light coating of cooking spray. Bake on middle oven rack for 6 minutes. Remove from oven and gently turn pieces over. Spray other side with a light coating of cooking spray. Return to oven and bake about 4 more minutes, until coating is lightly browned and turkey is cooked through. Serve strips with warm dipping sauce. Enjoy! Last night the staff at Balanced Motion Pilates and Yoga attended the One Step Beyond Success Seminar put on by Enterprise Temiskaming at the Holiday Inn Express celebrating International Women’s Day. What a great night! We had the privilege of getting to listen to 3 key speakers. all local women in business, tell their stories of the road to success. We walked away feeling empowered, inspired, and motivated…..and so this morning while searching for a Friday education piece on, what else, MindBodyGreen, the following Blog caught my eye 🙂 Enjoy the read and have an awesome weekend!